The fifth batch of research equipment for Dr. Guy Trudel’s MARROW study is headed for the stars on April 2. It will be among vital supplies and new experiments being delivered to the International Space Station (ISS) on board the SpaceX Dragon. The MARROW (bone Marrow Adipose Reaction: Red Or White?) study, a collaboration with the Canadian Space Agency, is investigating the effects of microgravity on the bone marrow of astronauts. As lead investigator, Dr. Trudel – a uOttawa professor and clinician at The Ottawa Hospital – hopes to shed light on what might happen to the human body during deep space exploration, such as a manned mission to Mars. Beginning in 2015, the MARROW study will see the participation of 14 astronauts over five years. Each astronaut submits blood and breath samples before flight, collects his or her own blood and breath samples while on the ISS using specialized equipment, and submits to further testing after returning to earth. 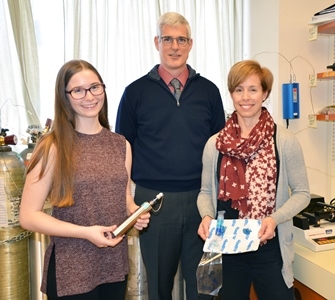 Dr. Trudel’s team has received four SpaceX Dragon deliveries of samples from the ISS over the last three years and the April 2 launch will restock the ISS with enough supplies for the upcoming astronauts taking part in MARROW to carry out their sample collections. The MARROW project has had incredible success with the supplies they’ve received from the ISS, reports Dr. Trudel. So far, the vast majority of returned blood tubes and cannisters have arrived back on Earth and later delivered to our laboratories at the University of Ottawa intact; containing blood and breath samples of high quality, giving precise results. The bone marrow is a vital organ since all blood cells are produced by marrow. Without it working properly and producing enough blood cell counts, humans can die. That’s why the MARROW study is crucial to understanding how to prevent or reverse space anemia and degradation in blood cell count.